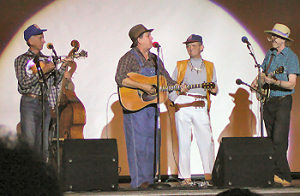 July 2002: The "Darling Boys" in New Castle, IN. Weaver's Department Store - All kinds of Mayberry items. When I think of The Dillards, one of the first things that pop to my mind is "The Darling boys" from The Andy Griffith Show. 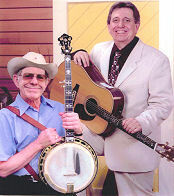 I would expect that for those who are not fans of bluegrass music that "the Darling boys" would be the main reason you're looking at this page. The Dillards are MUCH more than just the "Darling" boys but Rodney, Doug, Dean and Mitch will always be thankful to the Darling's for helping to spread their brand of entertainment to so many generations. RodneyDillard.tv The official web site of The Dillards. MayberryValues.com Rodney Dillard and his wife Beverly are brining a wonderful program to churches all over America, proclaiming Mayberry values. Doug & Rodney Dillard Site by Thomas Aubrunner from Vienna/Austria. The site has Biography and Discography information as well as a listing of album covers and information. iBluegrass.com Just serach this site for "Dillards" to see the information that they have on The Dillards.